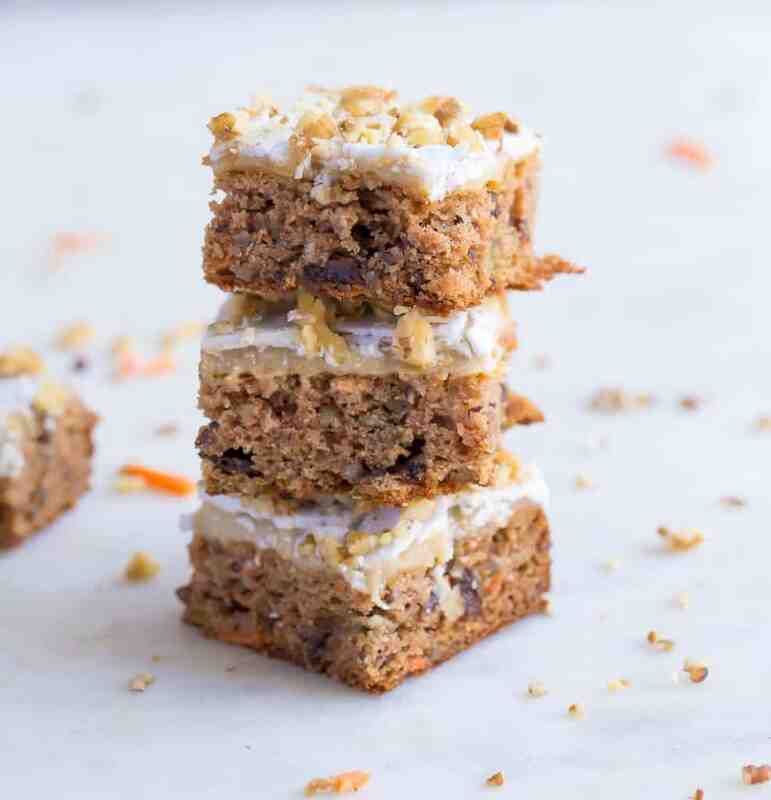 These Carrot Cake Bars are easier to make than a cake, and just as tasty! 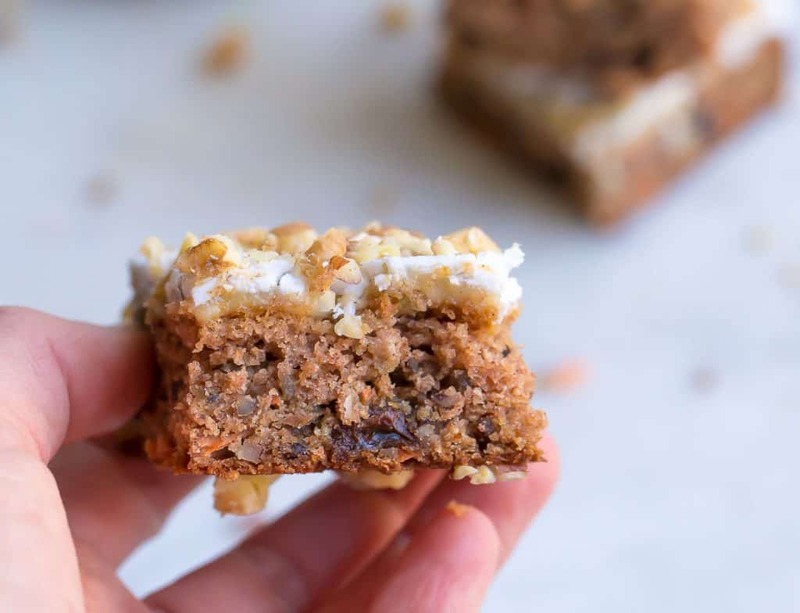 You’ll love the cake texture and carrot cake flavor, topped with the most delicious dairy-free cashew “cream cheese” frosting. Grain-Free, refined sugar free, and dairy-free but with the taste you love. 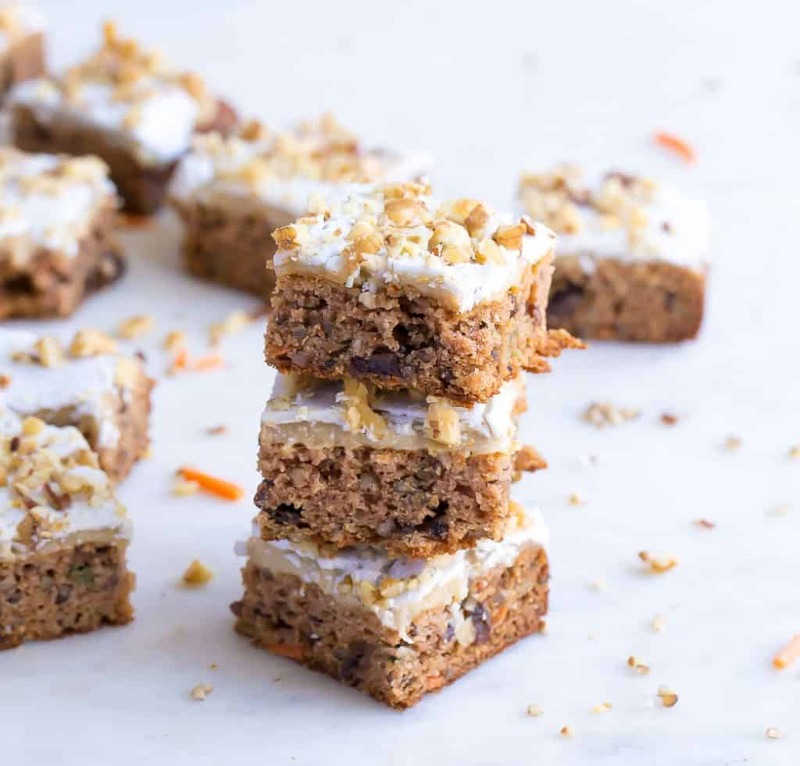 Spring time means that I will sometimes pass on chocolate in favor of carrot cake. GASP. I know….. me the chocoholic. There is just something about carrot cake and cream cheese frosting though, IT’S SOOOOO DANG GOOD!!!! 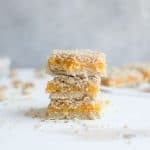 It’s my favorite sweet to enjoy if I’m doing a brunch, and most definitely always on our Easter menu. We had a recent brunch event at my kids’ school, and I knew I wanted to make something spring-y that was also portable and easy to transport. 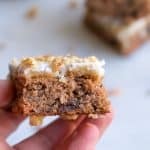 Instead of Carrot Cake, cut them into bars! Advice from my 11 year old, she’s a smart little cookie. I love the way these turned out. 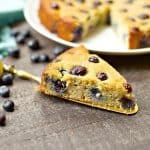 The texture was perfectly cakey and moist, but also had the fun texture of carrots, nuts, and raisins. After I lined my 8×8 pan with parchment paper, I simply mixed the dry ingredients in one bowl, and the wet ingredients in another. No mixer required! Then folded in the raisins and nuts, and spread the batter into the pan. They only bake for 22 – 24 minutes. 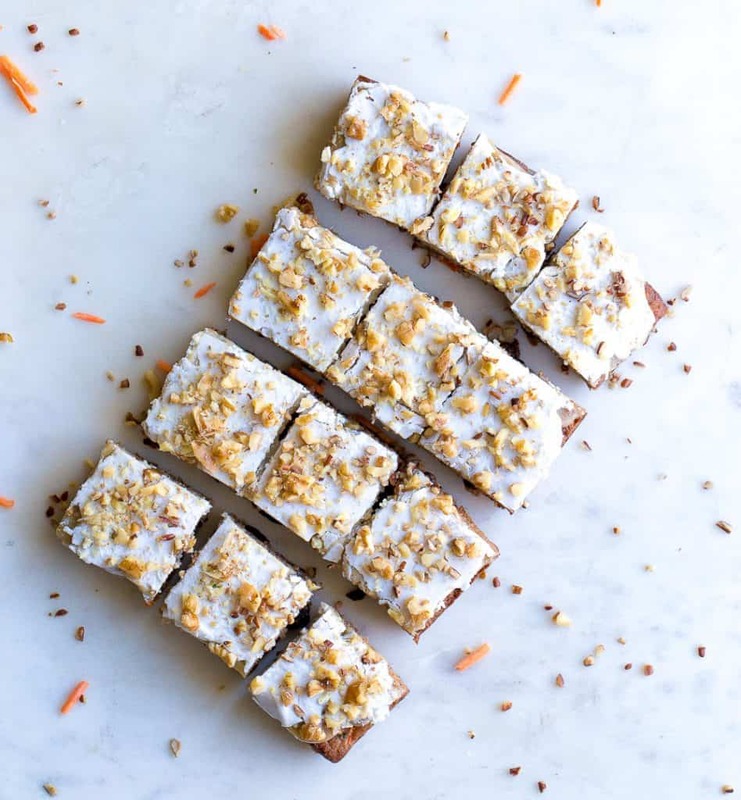 While baking whip up your cashew cream cheese frosting! In a food processor, you’ll whip up soaked cashews, coconut cream (from a can), lemon, lemon zest, vanilla, and honey. 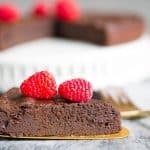 The frosting becomes light and fluffy, but does require a few iterations of pausing and scraping the sides with a spatula. Once the cake is cooled, generously spread the frosting and refrigerate! Be sure to chill before cutting. The frosting will set nicely and turn more of a taupe color (full disclosure that I added an additional light layer of frosting that was more white for the photo). I topped with additional walnuts, but you certainly can omit that step. You can store in the fridge for up to 1 week, or in the freezer for one month. Preheat the oven to 350 degrees. Lightly spray an 8x8 square pan with non-stick spray, then create a sling with parchment paper so that the paper hangs over the sides and allows for the bars to be easily removed once baked. Set aside. In a medium sized bowl, whisk together the dry ingredients: flours, coconut sugar, cinnamon, allspice, salt, and baking soda. In another bowl, whisk together wet ingredients: coconut oil, eggs, and vanilla extract. Fold wet ingredients into dry, mixing with a spoon until no dry pockets remain. 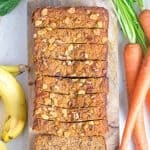 Now fold in carrots, raisins, and nuts. Continue to stir until well incorporated. Spread the batter in the prepared pan. Transfer to the oven and bake for 22-24 minutes. Remove from oven and let cool. Meanwhile, make the frosting. Combine soaked and drained cashews in a food processor with coconut cream, honey, lemon juice, lemon zest, vanilla, and a pinch of sea salt. Pulse until smooth and creamy. This may take several minutes, and pausing to scrape the sides of the food processor. Once cake is cooled (about 30 minutes), spread frosting evenly over the cake. Refrigerate for at least 1 hour, or until frosting is firm. Then cut into 9-12 squares. *prior to making the cashew frosting, soak raw cashews in hot water for at least 15 minutes. Drain the water, then proceed with the frosting. **Coconut cream is the stiff and firm portion of canned coconut milk. You can buy coconut cream in the can, or use the top of a canned coconut milk.